Whether you are living or working abroad, or planning to, Expat Financial is your brokerage source for financial and insurance services that form the pillars of any expatriate’s financial health. Don’t forget, Expat Financial is not just for expats, we can also arrange coverage for some local citizens who want international insurance where regulations permit. 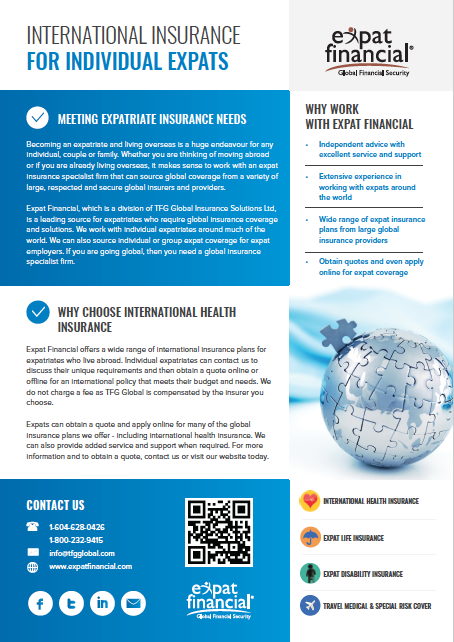 The most common request from our expat clients is international health insurance coverage, especially from our premier supplier Cigna International. The policies that we offer are not available from TFG Global Insurance Solutions Ltd. to citizens currently residing in the USA. For a quote or for more information, visit our Quote Request pages or send an email. Also check out our Expat Insurance Tips page. From basic in-hospital plans to in-hospital and out-patient plans that include a variety of options, such as dental. Various plans from several different insurance companies are available to be ordered or downloaded, viewed and even printed on-line so that you can send to Expat Financial or direct to the insurance company. The best expat health plan we offer is the Cigna Global Health Options Plan. Available to expatriates around much of the world who require global life insurance while living abroad. Protect your most valuable asset – your ability to earn an income. We offer an individual disability plan from William Russell for employed expatriates in many countries around the globe. Now expatriates and even local citizens can get information and even purchase short and medium term single trip travel insurance, Vacation insurance and flight accident protection on-line on a stand-alone basis via encrypted servers or print the brochure and application on-line of the web site! We also have a Multi-trip annual plan. Individual medical evacuation plans for individuals who are traveling abroad or residing as expatriates. Transfer funds from one currency to another with our referral partners at OFX. We have negotiated much lower rates for our website visitors and clients that you can take advantage of.